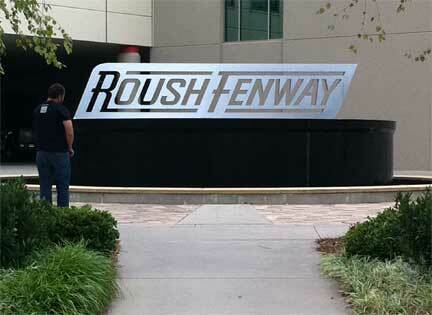 Last Friday part of the Geomagic Marketing team managed to escape the office and visit Roush Fenway - a giant in the world of NASCAR and Ford's arm for creating racing cars in the US stock car racing world - for a little of our version of R&R - Research and Racing cars. As users of Geomagic for quality control and 3D engineering, the company embodies high-end technical expertise throughout its entire operation, putting levels of thought into such tiny details that normal people (if you can think of us as normal) simply would not have considered. NASCAR can be a strange world of obtuse and seemingly random rules about car size, engine power, tire pressure and more. Tolerances are strict, and yet Roush aims to deliver performance that accurately meets every tolerance proscribed without losing a single millimeter in size or brake horsepower in the process. Everything, including external heat, engine heat, cooling effects and so on, is considered within the design and build operation, and then tested, checked, verified, adjusted and checked again. With an operation like this, very few things are left to chance and that includes checking each and every outsourced part, as well as every part created in-house. The company's engineering effort is paying dividends with winning drivers from all teams across recent years. Roush has surely become a powerhouse in NASCAR design and racing. For our trip, our aim was simple - we went to find out how Geomagic is being used, as well as score a car body part for our new office Showcase. We scored the body part, but also found ourselves immersed in a world of engineering excellence that took our breath away. Of course, since all the information on how they do this is confidential, we cannot talk about it. The team uses a GOM ATOS scanner, in combination with Geomagic Studio and Geomagic Qualify, to make their car designs as perfect as possible. 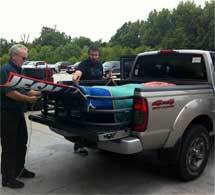 The car part we collected is a side panel from Trevor Baynes' Number 16 vehicle for the Nationwide NASCAR challenge. Baynes is a rapidly rising star in the Roush teams, and this year won the Daytona 500. We will be following his progress as the NASCAR season continues. 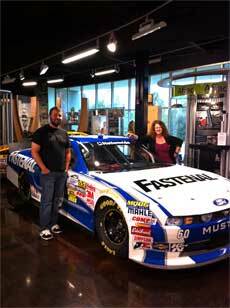 Figure 2: Tom and myself next to a Nationwide NASCAR in the Roush Museum, a car similar to the one from which the side panel came from. Figure 3: The front of Roush Fenway - an impressive campus which has absorbed most of the available land next to the Concord, NC, Airport.